We are closed for the Season and will Open the store Mid April. See you soon! including Fantastic weekend Breakfasts and Lunches. The Store will be opening in mid-April. We are looking forward to a great Boating season. 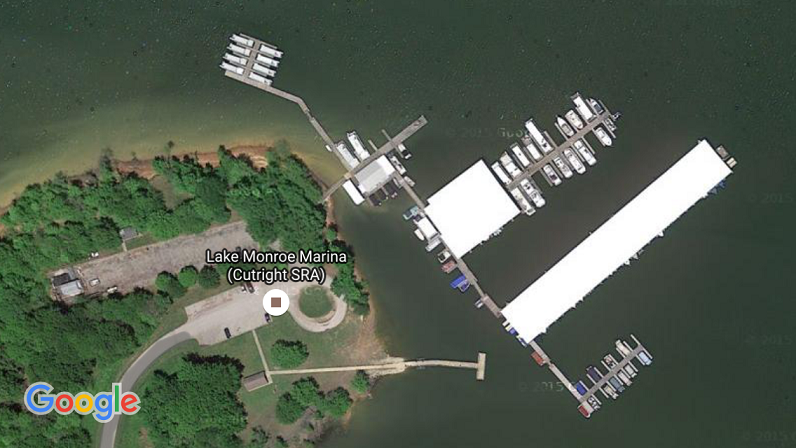 We have the most affordable Party Boat Rental rate on Lake Monroe in Bloomington Indiana. You must be 24 years of age to rent and be present at the time of Rental. We are located at the Cutright State Recreation area. We are just 5 minutes South of Paynetown SRA and on the East side of the causeway ! We have Two 17x32 Uncovered Slips available. and type of slip desired to be added to our wait list. Google Maps address is 8010 IN446. Our USPS address is 5505 E St Rd 446, Bloomington, IN 47401. Not all GPS locators show this correctly. From Bloomington turn South off of E Hwy 46 onto E St Rd 446 and go 8.1 miles until you cross the Lake (water on both sides) and turn left into Cutright SRA. Follow road past boat ramp to the end keeping to right.